This shot makes me laugh! 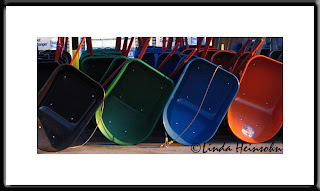 I loved the colored wheelbarrows plus the wonky angle of placement of the front row. This is the kind of shot I used to see around all the time but would kick myself for missing because I never used to carry my camera with me before I started this PAD.